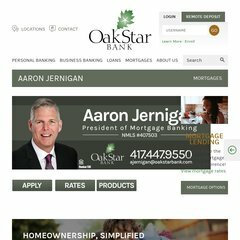 aaronjernigan.com About OakStar Bank in Springfield, Missouri | Aaron Jernigan ..
ethelcurbow.com Springfield, Nixa, Ozark, Rogersville, Republic Missouri Real .. The site is programmed for PHP/5.2.17. ns76.domaincontrol.com, and ns75.domaincontrol.com are its DNS Nameservers. Godaddy.com Inc (Arizona, Scottsdale) is the location of the Apache server. PING (184.168.187.1) 56(84) bytes of data.